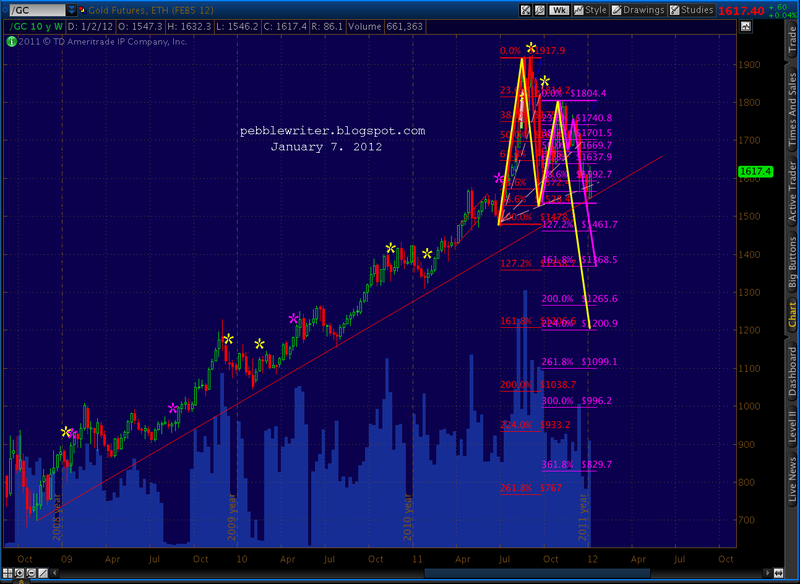 We’re bombarded with the gold bugs’ warnings. If you don’t convert every last cent into the shiny stuff right now, you’ll be ruined. But, before you run your wheelbarrow of worthless greenbacks down to the local PM dealer, let’s consider the technical picture. 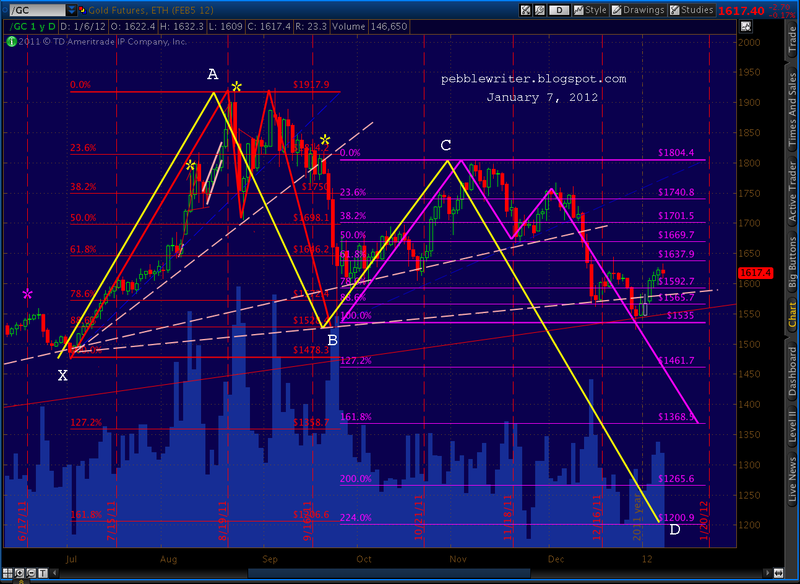 First, check out the harmonic picture on the daily chart. 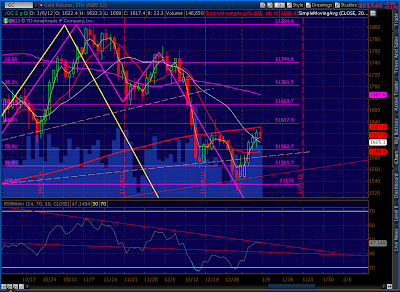 GC completed a crab pattern (purple, since 8/25) at the 1.618 extension of the XA leg. 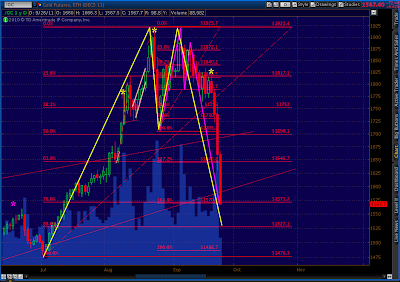 The target was 1570.20, and we just overshot that by 12. 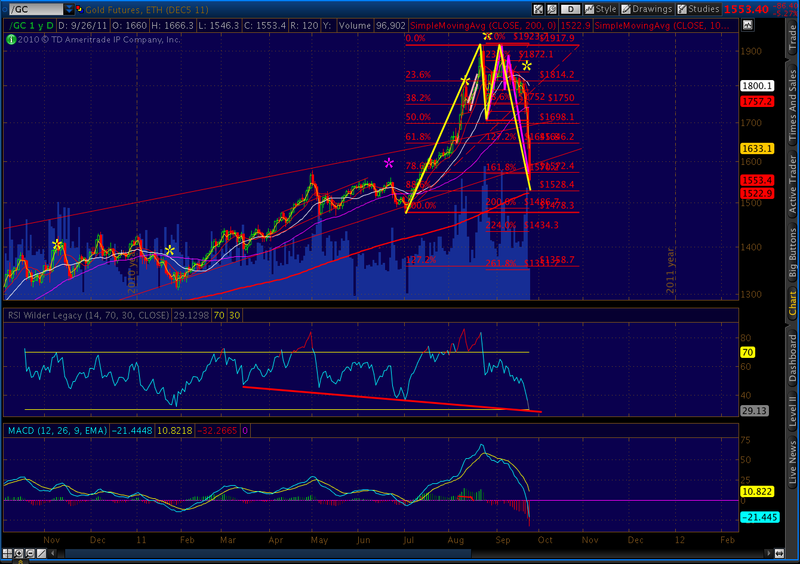 If I’m crazy enough to try and catch this falling knife (which I’m not) I can look at the RSI for confirmation. 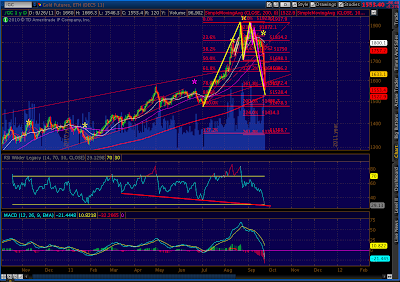 Check the red trend line on the daily chart, just up ahead of the falling RSI. It would certainly argue for a turn in the very near future. The point at which one pattern stops and the next begins is actually a Point B in a much larger Crab pattern (in yellow), although it could qualify as a Butterfly if we ignore the dramatic push down on Sep 26. A Butterfly would extend to the 1.272 or 1.618, at 1358 or 1206 respectively. 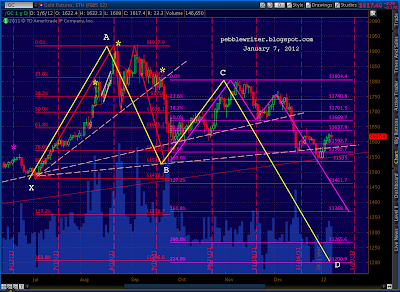 A Crab would typically complete at the 1.618 at 1206. 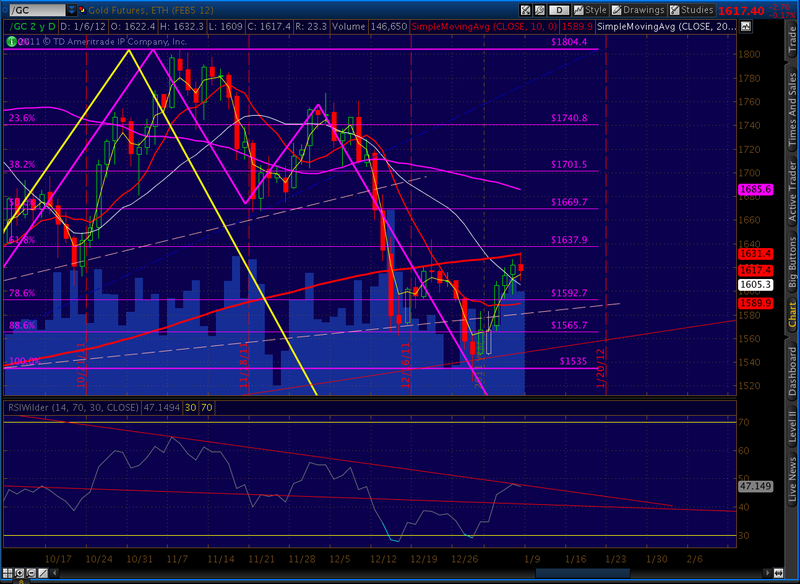 Either would fit with the still-forming Bat pattern (purple) that should complete at the 1.618 at 1368. 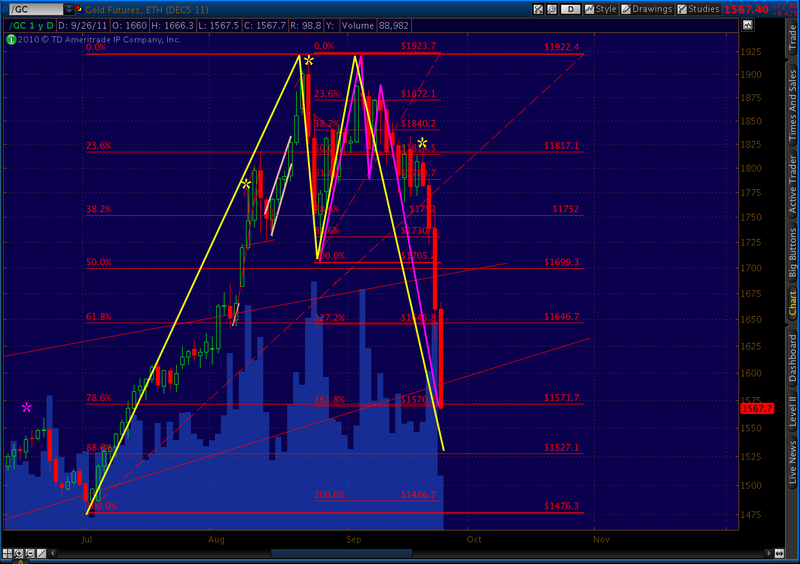 There are a couple of other important chart patterns worth noting. First, GC has been supported by a long-term rising trend line that provided the most recent bounce at year end. Also, the July 1 low has acted as the origination point for several fan lines that have heavily influenced GC. These can be seen as the pink dashed lines below. Each time one of them was broken, GC fell pretty dramatically. The back test of this latest break overshot the fan line by a little, tagging the 200 SMA just beyond. It also nudged the RSI up to a point where it’s hitting serious overhead resistance. If we bounce off the 200 SMA and RSI trend line and break the long-term price trend line at around 1550 shown on the weekly chart above, we’ll likely complete the Crab pattern — meaning a rapid descent of $250 or even $420/ounce. Is the Fed ruining the dollar? Yes. Will running the printing presses day and night eventually ratchet up inflation? Yes. Will gold be a great way to hedge? Quite possibly. But, in the meantime, gold’s not the safe haven you’re looking for. Yes, I think so too. Although, if you get far enough into the future, forecasting is subject to rapidly diminishing returns. How long will TPTB be able to keep the game going, and how will the dollar fare compared to other currencies and commodities? It's all very chummy now, as we need the EZ to hold together (the better to protect ourselves.) But, at what point does the US take a much more protectionist stand? Curious, Robert Prechter has always maintained that in a deflationary environment it's "all the same market". In other words, all asset classes will decline together. Back in 2008-09 we did indeed see gold, silver, oil, grains, meats, and foreign currencies decline along with stocks. 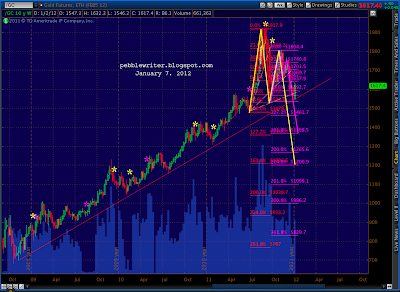 The logical conclusion is that gold will decline with everything else. Or is it? BTW, it goes without saying that all the patterns and channels, etc. can be easily derailed by something like a shooting war in the Gulf. Such is the nature of Black Swans. Otherwise, the long, painful process of de-leveraging will continue until the value/debt imbalance is rectified. One of the more interesting numbers in that series is the yield on the 10-yr during the depression. In 1941, when the 10-yr finally registered less than 2%, the 1-yr bottomed at .53% (the lowest in Shiller's 1871-2011 series till 2010.) PE's averaged 16.8 with a low of 13 during the 30's. We've already dipped below those rates rates, but have averaged a PE of 25.6 since 2000. What a refreshing commentary. Agree with PW and also Tom that the decline does not look at all complete – both in price and time from a wave perspective. I am a long term stacker, so I did buy a little physical gold and silver before Christmas, and will add on future dips. Glad to oblige. I haven't been doing much in gold lately, as stocks have required extra time and effort. Sometimes, a fresh look helps. But, I'm not as acquainted with recent day-to-day as a regular gold trader would be. So, take it with that grain of salt, okay Tom? And, I agree with you on the stocks. If we get the kind of melt down I'm expecting, everything will be affected across the board. Best of luck. Very glad to read this analysis. Thanks Pebble. I re-established my shorts on gold yesterday at 1630 after taking previous short profits at 1530, because I believe the downside is by no means over. And if Gold is a leading indicator (as it often can be) then we are due a waterfall decline in stocks any day now. Thanks for the update on gold. It is much appreciated.